(Bloomberg) -- Lira traders go into the weekend struggling to predict the possible reverberations from Sunday’s local elections in Turkey after days of turmoil left faith in the nation’s markets in tatters. Investors from Japan to Johannesburg were left pondering how the test of President Recep Tayyip Erdogan’s popularity in the municipal vote will play out when the markets reopen on Monday, given the short-selling restrictions that warped the lira’s moves in the past week. 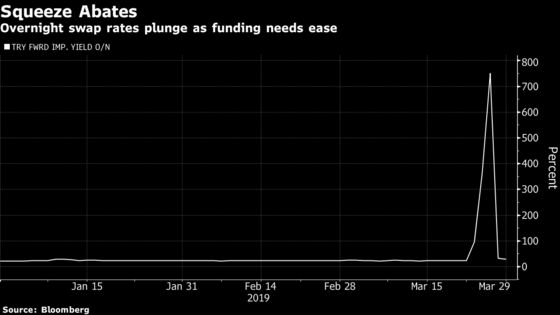 In Tokyo, the Gaitame Online Co. currency brokerage had slapped a notice on its website warning retail clients that lira liquidity had been scarce and volatility could spike at the open. Matete Thulare, a Johannesburg-based currency trader at FirstRand Bank Ltd., will be working out and binging on cricket and rugby this weekend, but he’ll also have one eye on his phone for Turkey headlines because investors use the rand as a proxy for the lira when trading is restricted. Though the vote only decides who leads Turkey’s cities, Erdogan has been on the campaign trail to bolster support for the ruling AK Party. The concern among investors is that a poor showing for the AKP would lead to more populist policies. At one point Erdogan blamed the currency’s swings on "operations” by the West to “corner” Turkey. Since he assumed sweeping powers last June, the economy has fallen into a recession, inflation has soared and opposition parties have aligned efforts to undermine his authority. Piotr Matys, a strategist at Rabobank in London, will forego his cycling this weekend to monitor the progress of the vote. 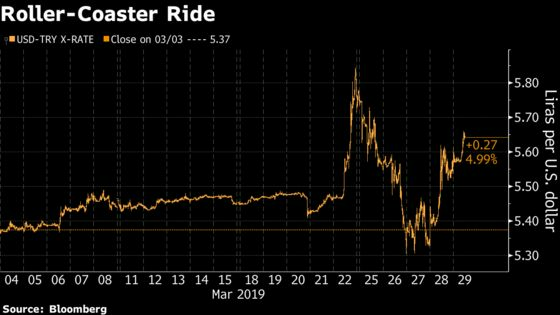 The lira’s whipsaw ride began on Friday, March 22 after a surprise drop in central bank reserves prompted speculation the central bank was supporting the currency and led JPMorgan Chase & Co. to recommend investors go short, amplifying the lira’s decline. Turkish regulators launched a probe into the bank over that weekend and limits designed to tame short sellers via offshore funding markets kicked in on Monday, propelling swap rates beyond 1,000 percent and trapping investors in their lira bets. While the restrictions helped the lira recoup losses at the start of the week, bonds and stocks sank as international investors dumped local assets in a bid to offset their currency positions. Meanwhile, local traders sprang into action, scooping up dollars on the cheap and sparking a secondary drop in the lira that continued into Friday’s session. For now, the exodus has slowed, swap rates are stabilizing and the lira was down only 1.7 percent on Friday evening, compared with a slide of more than 5 percent at one point the day before. Other emerging markets like South Africa and Brazil are facing their own local risks, but the rout hasn’t spread. The offshore funding freeze has left many despairing and forced to tear up strategies in a market that can turn untradeable so fast. That’s not good for Erdogan who relies on foreign inflows to finance growth of the Middle East’s largest economy. “It’s not a market that I think is worth touching right now,” Timothy Graf, the head of EMEA macro strategy at State Street Bank & Trust, said in an interview on Bloomberg TV on Thursday. If investors decide to go long, the market can move against them very quickly, he said.